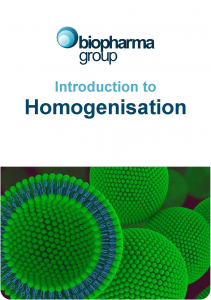 High pressure homogenisation is an efficient and easy to use technique for cell disruption and liposome/emulsion processing. The Emulsiflex C3 uses a dynamic homogenising valve. 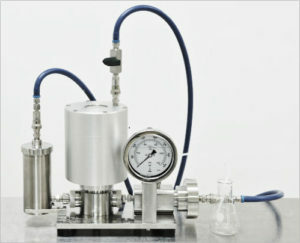 The benefit of a dynamic valve is that the samples are processed at a constant homogenising pressure. This produces very uniform liposomes and micro emulsions with a narrow particle size distribution. The Emulsiflex range of high pressure homogenisers from Avestin are ideal for a wide range of applications, commonly used within the pharmaceutical, biotechnology and fine chemicals industries. These include cell lysis, particle size reduction, nanoparticles, emulsions (emulsification), and liposome preparation. Additionally, it offers reliable, consistent processing at adjustable pressures of up to 45,000 psi, Both air-powered and electrically-powered systems are available, and options include filter/extruder attachments, temperature control mechanisms and automatic pressure control. The unique Emulsiflex design ensures that there are no ‘O’-rings or gaskets in the entire path of the product. This means less risk of contamination, easier cleaning and no leakage. Please note: Custom designed units can offer pressures up to 45,000 psi thus enabling the process the toughest of samples. 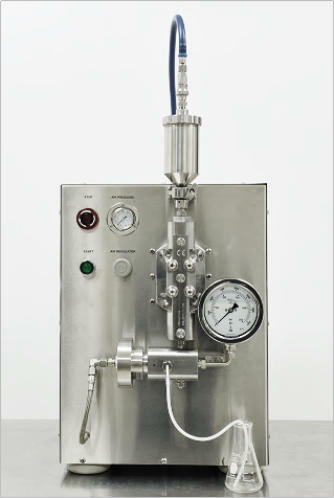 Pneumatically controlled, dynamic homogenizing valve. No O-rings or gaskets in product path: all face seals are precision-machined, metal-to-metal or metal-to-ceramic. Easy disassembly for cleaning or inspection. Impeccable scalability across research and production models, for reliable processing. Inlet and outlet temperatures can be stringently controlled with the installation of available heat exchanging mechanisms. Suitable for cold room use. Can be used in cleanrooms and for GMP manufacturing. All wetted parts are autoclavable and suitable for SIP. Support provided by UK-based service team. Installation, set-up assistance and full operator training are available upon request. 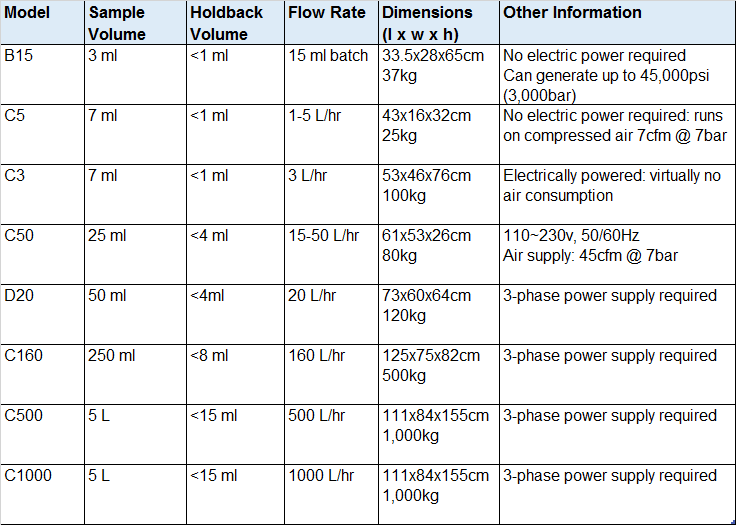 With models that can handle sample volumes of 3 mL (B15) up to 2000 L (C500/ C1000), and flow rates of 15 mL batch through to 1000 L per hour, the Avestin Emulsiflex Range offered by Biopharma throughout the UK and Ireland, could be the ideal solution to your homogenisation needs. The preparation of liposomes via liposome extrusion is becoming an ever-popular procedure, largely due to their ability to encapsulate both hydrophilic and hydrophobic compounds. This has become a significant advancement in drug and supplement delivery research, as ingested liposomal products often show significant bioavailability increases. The Avestin LiposoFast series consists of available hand-held and benchtop extruder systems, capable of producing unilamellar liposomes as small as 50nm, with a narrow size distribution. Temperature control is also available, for heat sensitive products, to maximize yield of viable liposomes. >>Product Focus: Which benchtop high pressure homogeniser is right for you? 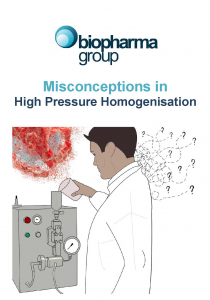 >>How to get the best out of your high pressure homogeniser. >>High Pressure Homogenisation for Efficient Cellular Lysis. >>Why you should choose extrusion for your liposomal preparation enhancement.